…Homebodiness was the reason I spent so much time stirring and sniffing my sourdough over the last weeks, instead of making dolls. I keep telling everyone that I want to make dolls, but I end up doing a little of this and a little of that. But that’s a side story. It’s the fact of me being a Homebody that got me into the baking, because I lack a dollmaker’s needle at the least, to begin on my dolls, which I have been reading up about, by the way. Reading about projects is also easy to do at home. But I can’t seem to kick myself out the door to drive five minutes to the craft store for the needle. And for old time’s sake I did want to make some sourdough bread. For a few years at least — maybe even a dozen? 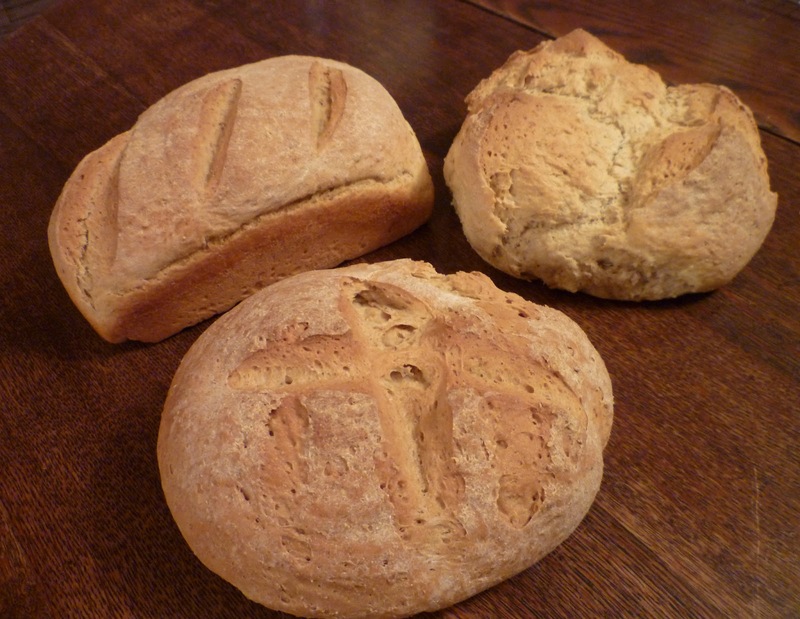 — my kitchen would churn out several loaves a month of the most sour bread you can imagine. The children liked it that way, as dense as pumpernickel but light colored and tasting almost vinegary if you were not in the right mood. I was always trying to get the crumb of a sourdough French such as our San Francisco Bay Area is famous for, but then I would lose the intense flavor. Later we lost all the biggest bread-eaters, and then I let the starter die. It had never been my own baby — the starter always had its beginning in someone else’s kitchen. In about 1975 I had been given my first batch by a church friend, and I used it for a few years until it was neglected (notice the passive and guilt-free voice) into oblivion. My neighbor Linda gave me my next sourdough, and I began using that in earnest. We’d eat sourdough pancakes for breakfast, sourdough biscuits for dinner, and slices of the tangy bread in the car on extended trips into town. One time a couple of slices were forgotten in the glove compartment for several weeks and when discovered they were not even dried out or moldy. I gave a jar of my starter to my neighbor Sarah, and when mine was forgotten for a time and died she gave me some back. But when I moved over the mountains to my present town my starter changed its personality and never was much fun again. I hadn’t really missed it until last month, when Jody’s fiddling with sourdough inspired me. I put together the recipes for two different versions on the same day, just to have a better chance of ending up with at least one active starter after a few days. The one I was most confident in is called Manuel’s Rye Sour, a recipe I had seen decades ago in my Laurel’s Kitchen Bread Book. I happened to have more of that pumpernickel rye flour around so it was a natural to use it. The second recipe I found online uses some pineapple juice along with the flour and water. That one is only now after about 10 days starting to have a good sour smell, so I’m glad I didn’t have to twiddle my thumbs waiting for it. Manuel’s starter was usable after about five days. 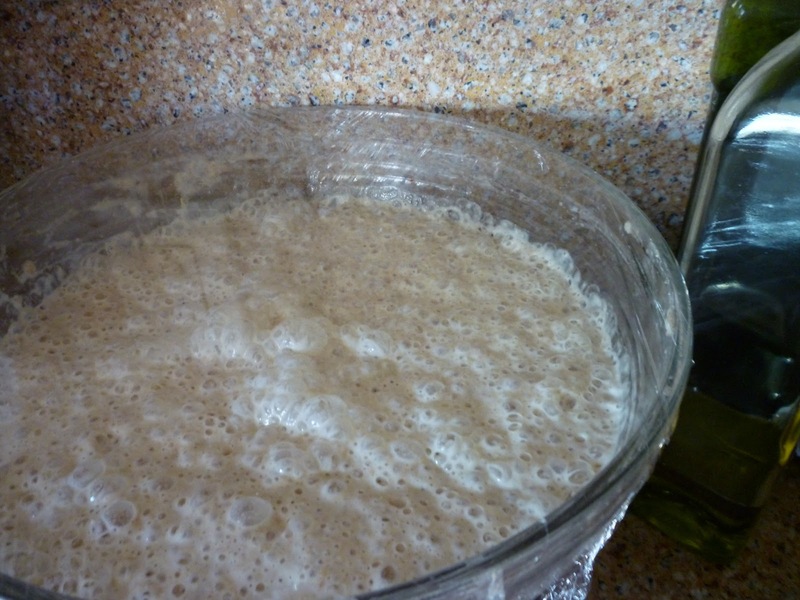 I used it as I had my old starters: to get the strong flavor I’d add six or eight cups of flour and some water to a cup or two of the starter and let that sponge sit on the kitchen counter for 24 -72 hours until the whole big bowl was busy growing the desired yeasts. 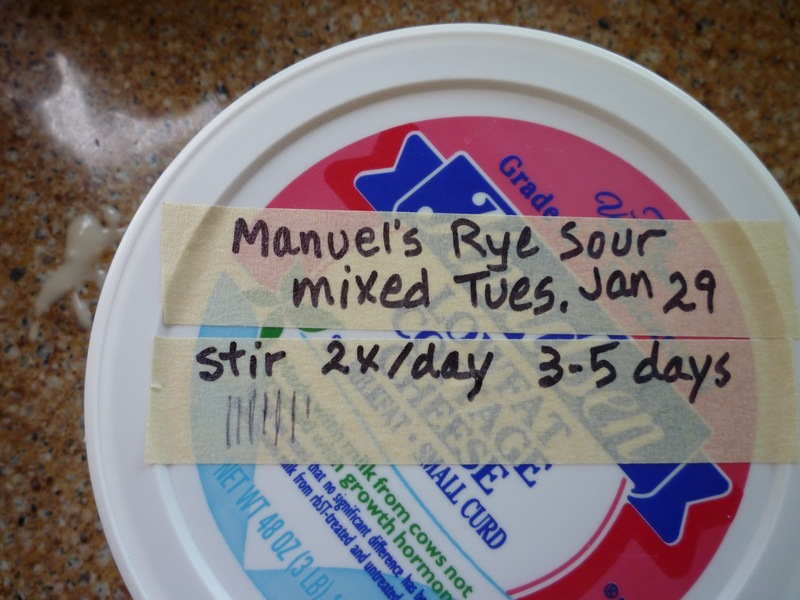 It didn’t take long for Manuel’s Sour to get to working. The sponge rose with the activity of the sour bugs, and then fell again, but it kept developing flavor for another day until I could get to it. This whole description is beyond anyone’s ability and probably desire to duplicate, so I won’t give you a recipe, but I will say that to this sponge I added a small amount of yeast, sugar, salt and oil, and enough flour to make a smooth dough. 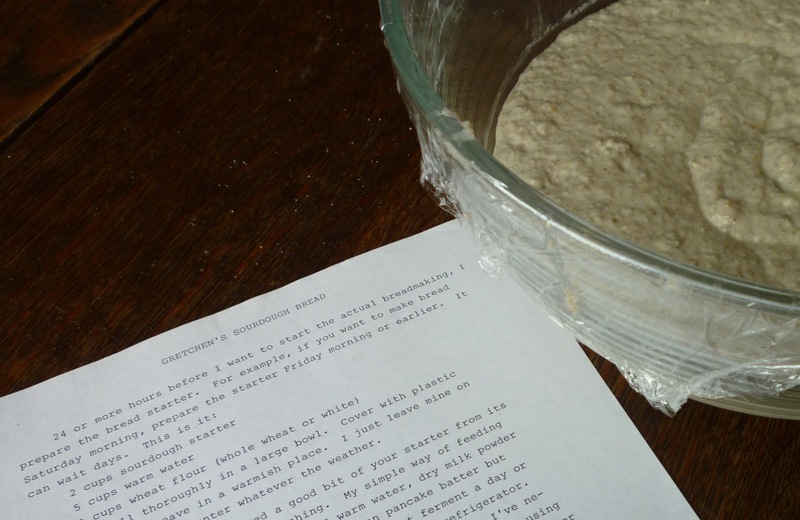 Many years ago after a couple of friends asked me about my method of making sourdough bread, I wrote a long description of the process that is so complicated and variable, “sometimes this” and “sometimes that,” I can hardly plough through it today. But I referred to it when baking this time. After kneading my dough I didn’t let it rise in the bowl again. 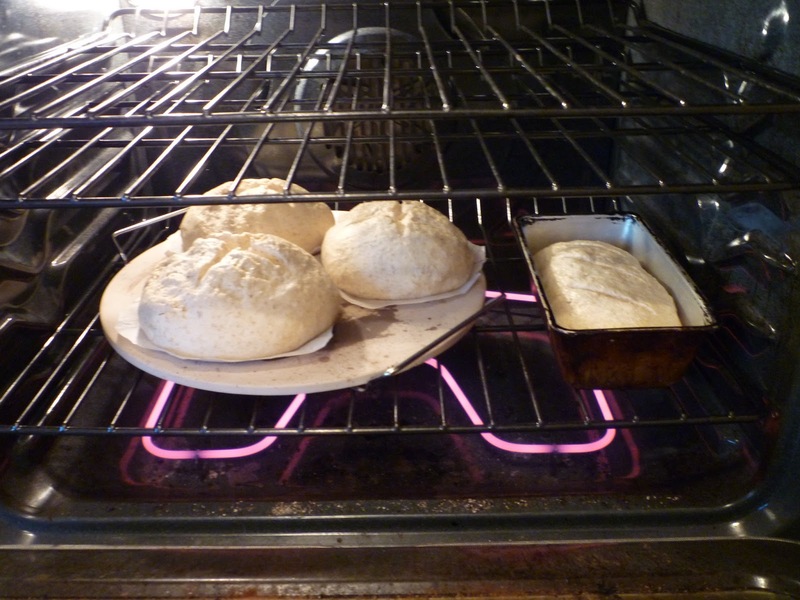 I just formed the loaves, which weighed just over a pound each, and set them to rise. In the distant past the proofing would often take all day, whether or not I added commercial yeast to assist the wild. This time, Mr. Glad and I took a 40-minute walk around the neighborhood, and when we got back they were ready to put in the oven. My pizza stone was still around from the pizza lunch, so I baked some rounds on it, and the remainder of dough in a loaf pan. I used parchment paper to slide them on to the stone. They took an hour at 375°F to bake. I was pleased enough with the bread….It wasn’t as sour as I might have liked, and the addition of rye flour made it less chewy than my ideal — I had intended to add some gluten flour for chewiness but forgot. So now I’ve begun my series of experiments, as I’ll think of these cooking adventures. I managed to give away the prettiest round loaf today, and if I can find enough gluten-tolerant people around to give bread to I’ll be happy. Tomorrow, tomorrow — “I love you, Tomorrow!” — it’s off to the craft store for a needle. Then next time my Homebody Self can sit stitching at my doll while the bread bakes and the house fills with its good and toasty smells. Yum, I say. 🙂 I have some of that Amish Friendship starter working now (found a recipe online to make the starter after everyone says it's only available from the Amish…ha! ), but not any other starters. Have made a sourdough with the dried potato flakes, but am intrigued by yours. Rarely do I run into anyone who wants to take the time, so enjoyed reading about your bread-making adventures! It looks lovely. 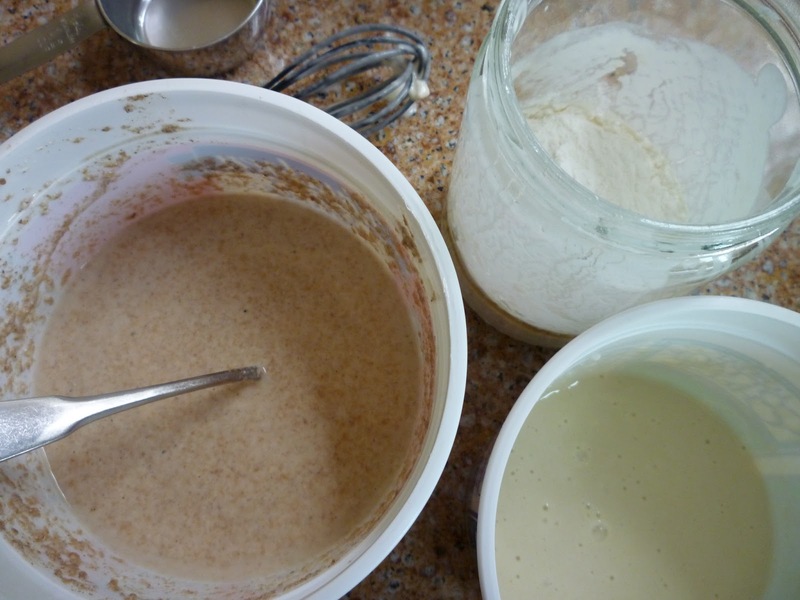 I have had a longing to do sour dough all of this week. I need to just stop procrastinating. I just love the way your bread looks. 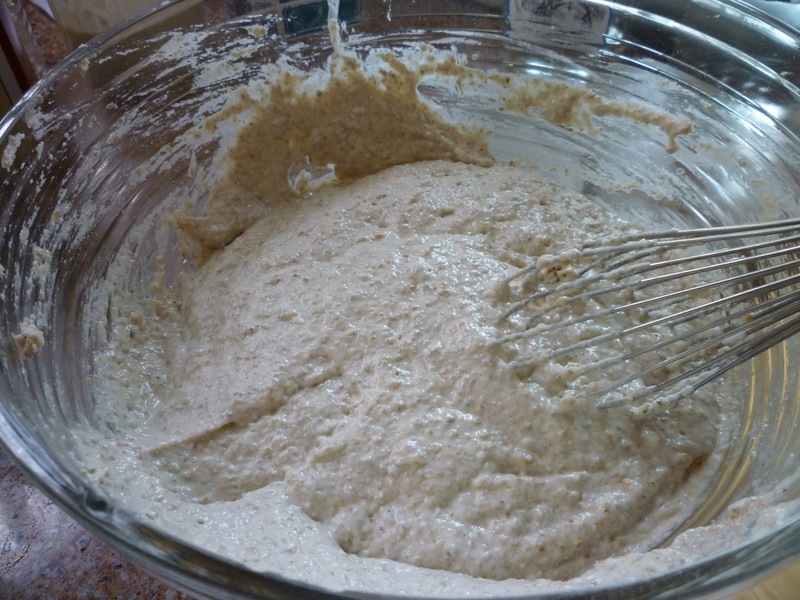 I tried a pineapple and flour mixture and got lazy…I guess I don't ♥ the taste of sourdough that much, either. I should try it again. I love the connection with our history involved in making things. 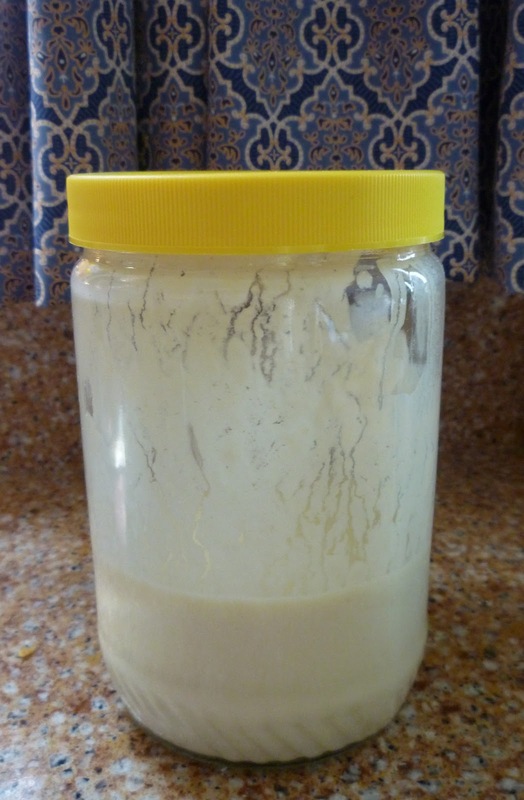 There was a time when yeast wasn't readily available in a jar. Your loaves are beautiful! I haven't had a starter for several years. Your crusty loaves reminded how much I do love home-made sour dough! Love sourdough, but have never tried it. Starting a sourdough sounds as difficult to me as getting out to buy a needle sounds to you..
Gretchen, the bread looks amazing; wish I could be there to help taste test. I've still not baked bread but have been baking cookies and short bread and giving them away. Hooray for starting on the sour dough adventure once again! I've had to leave my starter in the fridge for the past week. I'd better feed it and see how it reacts. Your bread looks great. I'd love a slice right now. I hope it lives on for a while! The loaves are lovely. Did you get the needle? There was an interesting article in yesterday's NY Time mag about whole wheat and sourdough loaves, and I'm thinking about making my own starter, especially as Jack loves sourdough bread. I'm such a homebody, I can't hardly stand it. 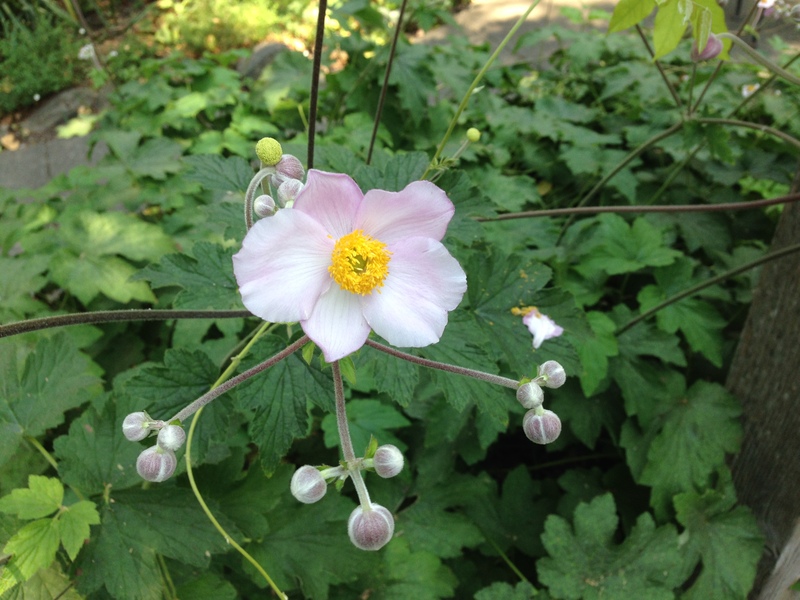 I went on a trip last weekend and then all last week I walked around blissed out because I was home. Of course sourdough smells a little sour even in the oven, compared to the regular yeasted breads – my husband went upstairs trying to escape the smell! But he likes the finished bread. I'm going to try using the pineapple starter now, because after I added a little buttermilk to it, it got busy. Melissa, I haven't heard about the potato starter – maybe that will be my next experiment! I knew when I read the post's title I was in for a treat! So very satisfying. BrightSoul, I love that verb “to butterfly” ! But it sounds too lovely to describe my behavior. It is dear of your husband to think of your actions this way, whatever they may look like to the rest of the world.